Rising gas prices, sprawl and congestion, global warming, even obesity—driving is a factor in many of the most contentious issues of our time. So how did we get here? How did automobile use become so vital to the identity of Americans? Republic of Drivers looks back at the period between 1895 and 1961—from the founding of the first automobile factory in America to the creation of the Interstate Highway System—to find out how driving evolved into a crucial symbol of freedom and agency. Cotten Seiler combs through a vast number of historical, social scientific, philosophical, and literary sources to illustrate the importance of driving to modern American conceptions of the self and the social and political order. He finds that as the figure of the driver blurred into the figure of the citizen, automobility became a powerful resource for women, African Americans, and others seeking entry into the public sphere. And yet, he argues, the individualistic but anonymous act of driving has also monopolized our thinking about freedom and democracy, discouraging the crafting of a more sustainable way of life. As our fantasies of the open road turn into fears of a looming energy crisis, Seiler shows us just how we ended up a republic of drivers—and where we might be headed. "Seiler brilliantly illuminates the phenomenon of 'automobility' as key to US society and culture from 1895 to 1961. . . . This is a landmark book." "Written with grace and authority and finely wrought insight." "Seiler’s argument is strong and elegant because it raises a point of wonder: how did a people, so rash and so blunt in many ways, manage to live out their desires in broad daylight to the extent that they did and still do?" 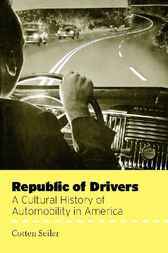 "Republic of Drivers is likely to become compulsory reading for anyone researching automotive history and may well become a major text for American Studies students who are trained to think in interdisciplinary ways." Cotten Seiler is associate professor of American studies at Dickinson College.